Peaceful fish that can be kept in a community aquarium. The aquarium should be heavily planted on the sides and background. In the middle you should leave much free swimming space. A cover of floating plants is necessary to provide a refuge for young. The plants should be suited for hard water like Vallisneria and Javafern. They are omnivorous but they prefer algae. Frozen and dry food are accepted as well. Breeding is very easy. Every 4-6 weeks up to 80 young fishes are born. They hide between the roots of floating plants. You can feed them with crushed dry food and baby brine shrimp. They don’t do well with lots of water movement, so less powerful filtration will better suit them. 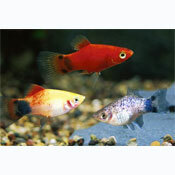 Aquarium platys intentionally or accidentally released into the wild are establishing themselves in various places well outside their native range.